A Dutch Botanist by the name of W. DeVriese is responsible for naming this Bromeliad back in the 1800's. It has over 250 species and hundreds of hybrids. Vrieseas are grown primarily for their beautiful inflorescences among the 250 species. The size difference is huge, ranging from a tiny 4 inches in diameter, to over six feet in diameter. This is one of the few families that are unique in this way. Although vrieseas are closely related to tillandsias, the plants are usually very different. 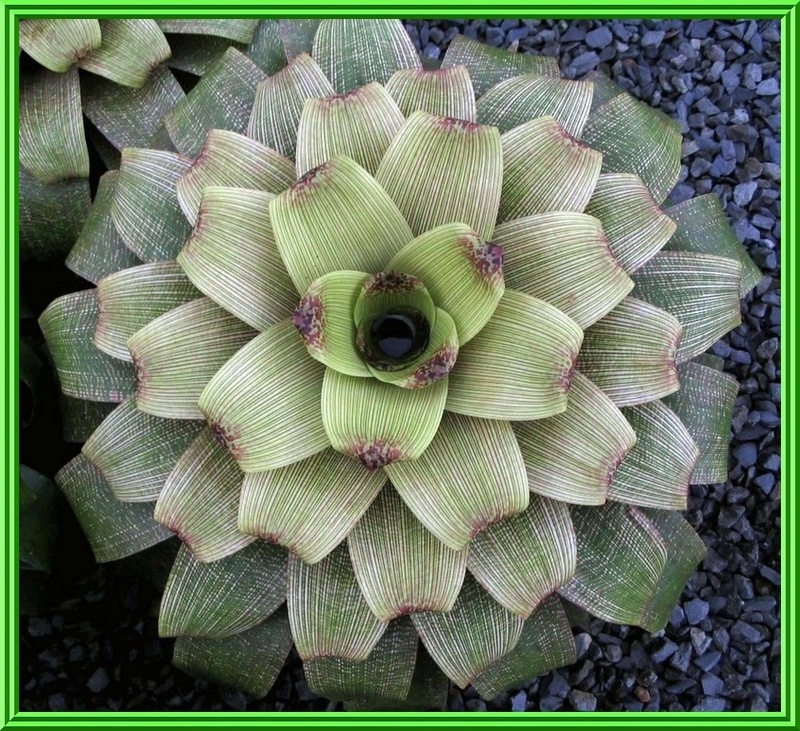 Most vrieseas are tank bromeliads with soft, shiny, nearly scaleless with yellow-green to dark green leaves. Many have foliage that is red or strikingly marked with intricate patterns of bands or translucent windows. The mostly sword-shaped, strongly flattened flower spikes vary from single to many-branched and the bracts are usually colored brilliant red or yellow and last several months. Bicolored and multicolored flower spikes are very common. Many hybrids have been produced and these cultivars are vastly superior in color and ease of culture to most of the wild species. 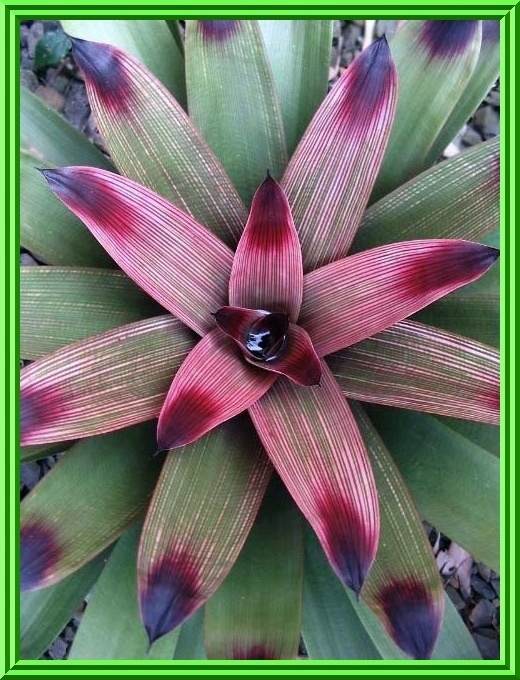 One of the advantages of this colorful bromeliads is... they keep their color longer than the inflorescense. The color of the inflorescense ranges from the yellow's... red's... oranges, pinks... dozens of different greens... purples, speckled and combinations. The inflorescense spike is a paddle and sword type with varieations. Where the colorful foliage plants have more of a bract type of inflorescense... they are not known for having any spectacular coloration. 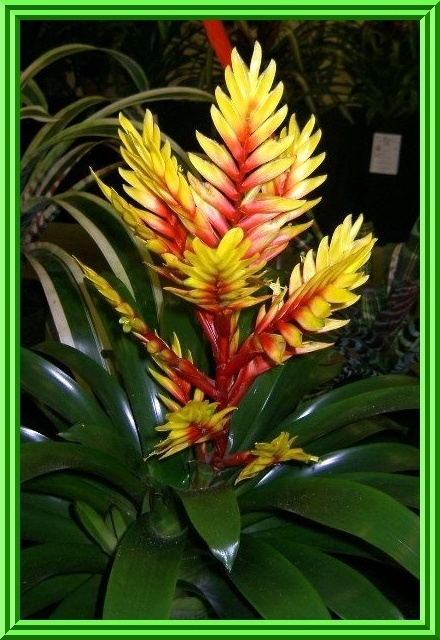 Vrieseas adapt to a wide range of lighting conditions from fairly deep shade (guzmania conditions), to nearly full sunlight (neoregelia conditions), a range of 1500 to 8000 footcandles. At higher light intensities plants require high humidity to prevent them from burning. The best growth is obtained between 2000 to 5000 footcandles of light. In sunny climates, this translates to 60% to 70% shade cloth. Vrieseas adapt to a wide range of temperatures. The mid 90s F. are tolerated with good air circulation, but hot, stuffy conditions will quickly damage the plants. Hot nights adversely affect foliage and inflorescence color. The Brazilian species and hybrids will tolerate near or slightly below freezing, and the Central American and Andean species will not tolerate any cold what so ever. Follow basic bromeliad culture. Vrieseas adapt to strong or weak applications of fertilizers. Follow basic bromeliad culture. Small pots are especially important for this group. Vrieseas are not recommended for mounting except in very humid conditions. Vriesea's are a little harder to grow. The correct application of good water and potting mix... and the proper amount of slow-release and folar fertilizers, is essential for proper growth and form. One of the general rules is... they like more shade than sun. Of course there are exceptions... such as Imperialis... Vinicolor, and some others that can take full sun.